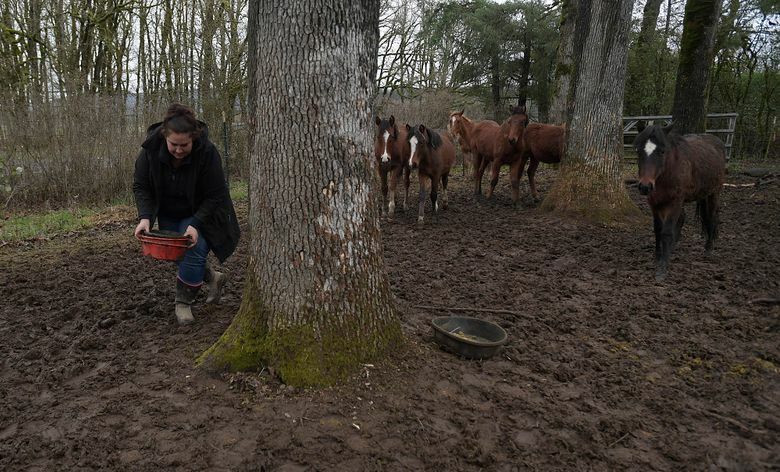 ALBANY, Ore. (AP) — Tami Fawcett calls the wild mustangs frolicking in a pasture near Scio “the kids” since they are only a few months old. Each has a name — Freckles, Brush, Sage, Paco, Hope and Ruby — and it’s easy to tell by their playfulness that they are youngsters. Fawcett — an Oregon State University master’s degree candidate — would like nothing better than to start the New Year off right than by finding good homes for every one of them. As the founder of Mustangs MEND — Mindfulness, Empathy, Nurturing, Dignity — Fawcett recently rescued seven 3- to 8-month-old mustang colts from a Nevada kill pen. They came from tribal lands in Nevada. Fawcett, 34, said the nonprofit 501(c) 3 Mustangs MEND also requires the adopting families to have solid fencing, shelter, and minimal care requirements such as access to a farrier, proper feed and veterinary services. Fawcett’s life took her away from horses as she left home for college and then worked for several years before returning to college to earn a degree in global studies from Cal State University-Monterey Bay. She came to Oregon to work on a master’s degree in gender studies. Fawcett believes that rescued horses can teach humans about leadership. Currently, Fawcett is working with Eve Good, who has 11 acres near Scio. They met after former renters left a horse at Good’s property. The small farm is now home to eight rescued mustangs, six wild orphans from a Nevada Paiute reservation, a curly mustang captured in Nevada and a 2-year-old filly rescued from the Warm Springs Reservation. Mustangs MEND can use donations of money, feed, used tack and equipment such as feed buckets and most of all, families that want to adopt one or more of the horses. 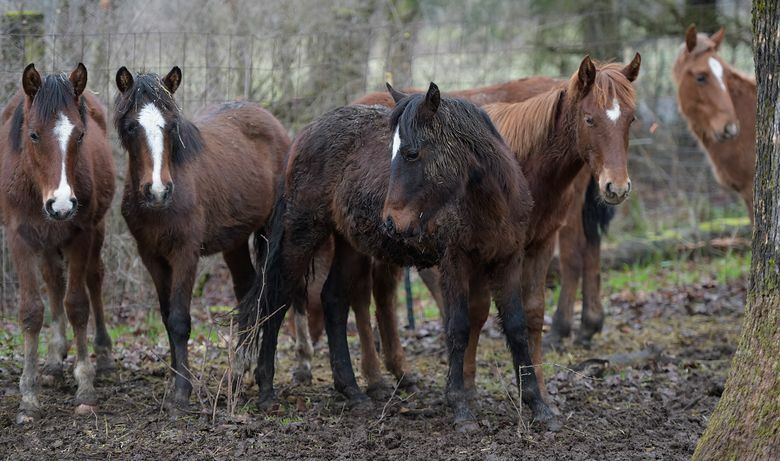 They also need bedding pellets, wood stove pellets, funds to castrate colts — about $150 per colt — vitamin supplies and ultimately, an indoor facility that could be leased. Fawcett’s goal is to save the wild mustangs from slaughter. Thousands of mustangs are sold each year and transported into Mexico or Canada to be processed for both human consumption and dog food. Fawcett often attends area auctions and buys the horses. Contributing to the mustang problem is that there are thousands of mustangs on native American tribal lands spread across the United States. The tribes do not have funds to manage the horses and in turn, the horses suffer from lack of food and the tribal lands suffer from overgrazing. The horses are often sold for slaughter. Mustangs MEND has found homes for more than 30 horses in 2017. Two years ago, Fawcett fostered and tamed four young mustangs from the Warm Springs tribe through the Warm Springs Horse Network rescue. Fawcett said the mustangs can be gentled into outstanding pleasure riding horses. 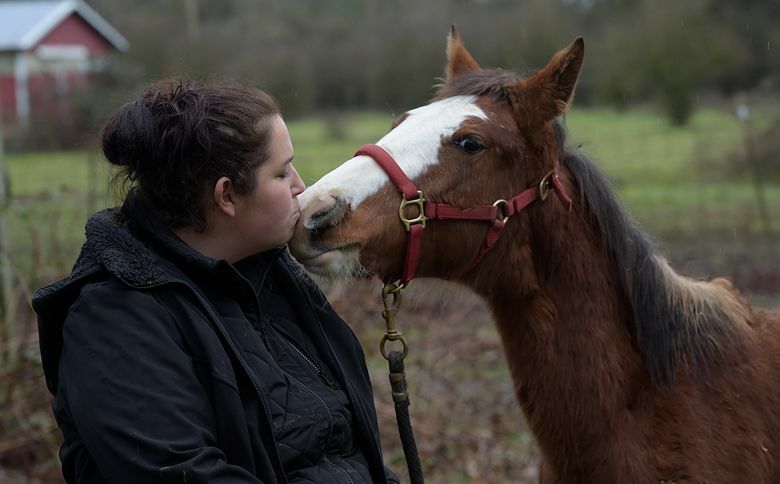 “I think it’s important that adopting families find the horses to be both friendly and useful,” Fawcett said. Fawcett said society needs to also think long-term about managing the wild mustang population and that may include birth control. She said dart guns can be used to deliver birth control medications that last up to two years. Fawcett said that because horses are “herd animals,” they bond well with humans. One of her rescued horses was named the In-Hand Reserve Champion at the 2017 Oregon State Fair.